A couple of weeks ago we showed you the first print from the Fringe Focus “Famous Desks” series with an awesome print showing the workspace of Mr. Tony Stark. Now artist Rob Loukotka is back for part two in the series and this one is equally awesome. 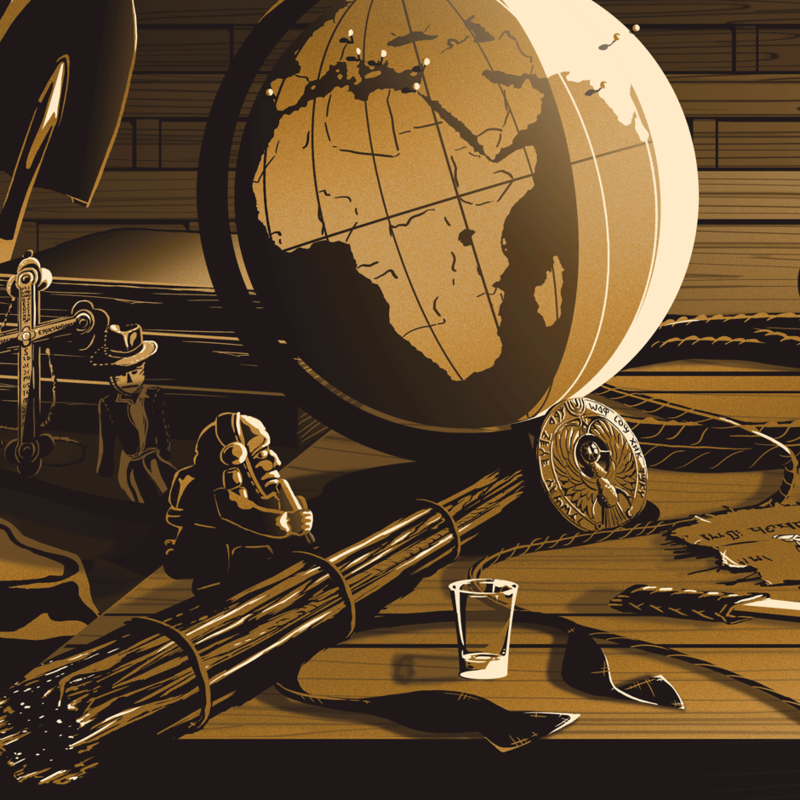 Titled, “The Desk Of Dr. Jones” this all-new, 36″ print features the desk of none other than Indiana Jones. Here is what Rob had to say about it. This is the second poster in my planned series of famous desks. The Indiana Jones trilogy is rich with beautiful objects, and Indy’s desk is prominent in two films in the trilogy. You should note that this poster assumes that Crystal Skull never happened. You’re welcome. The illuminated golden fertility idol from Raiders of the Lost Ark, the sacred stones from Temple of Doom, the Holy F***ing Grail from The Last Crusade. The magnitude of amazing objects in these films is second to none. I realized this as I was taking notes to build my drawing list, and I could not stop. This unofficial kind-of-a-movie poster packs over 40 items from the films into one scene. This limited edition fan art is available now while supplies last (supplies being an edition of 350 prints then they’re gone). Metallic gold ink (and brown ink) on cream paper. Like my previous (and future) Famous Desk Posters, this illustration is anachronistic. Not only does Indy’s desk have items from all three films, he straight up has things that do not belong on his desk. The holy grail, the sacred stone, I put an actual bazooka from Raiders on his wall. The items are accurate, but please excuse the blatant mish mash of the canon. Haha. This is meant to be a collection of gorgeous objects, so a lot of artistic liberties were taken. We LOVE that Rob included Short Round’s baseball hat in here and all the other references are spot on as well. Rob is making it easy for fans who get these prints with custom made, 36″ X 12″ frames. If you hit up his OFFICIAL STORE and order $70 or more, you get free shipping on the entire order too! 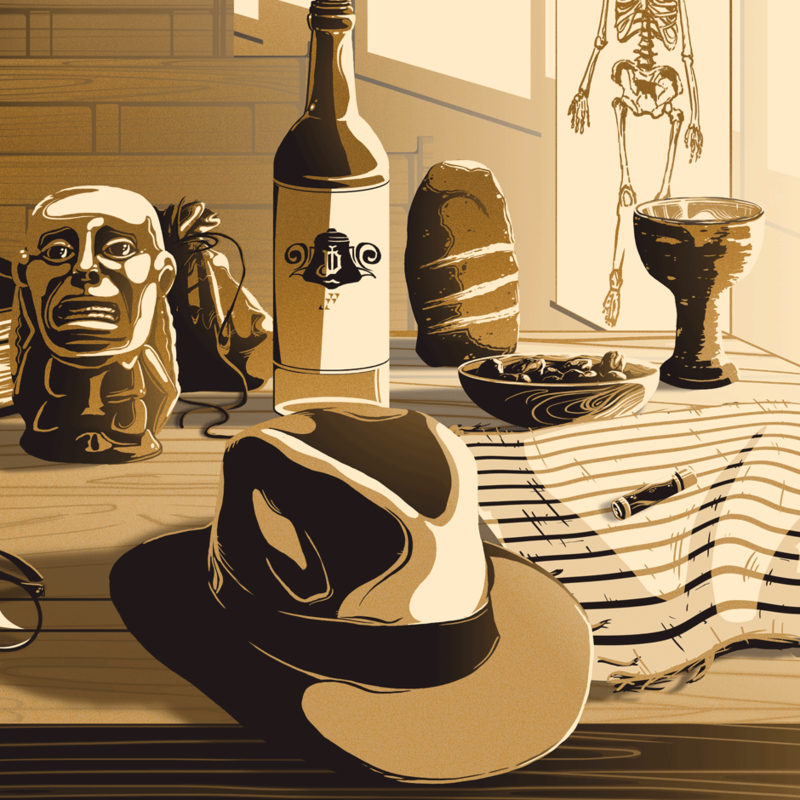 This entry was posted in Art, Movies, Posters and tagged Fringe Focus, Indiana Jones, limited edition print, Raiders of the Lost Ark, Rob Loukotka, Short Round, Temple of Doom, The Desk of Dr Jones, the Holy Grail, The Last Crusade, Tony Stark. Bookmark the permalink.